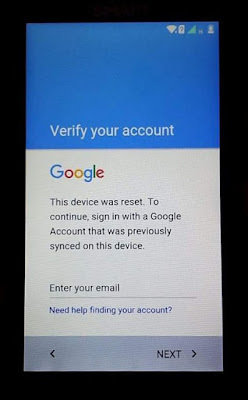 For Android lollipop and above, the new feature is Factory Reset Protection (FRP) lock. this means that you need to sign in your entered email before. after you reset it require to sign in. then how if you forgot what email it is or password. then this trick may help you. Follow this steps carefully with screenshot Credit and thanks to Azis. 1. Touch Enter Your Email to show keyboard. then press @. 3. Select two Language, English US and English India. 4. Go back to keyboard, then tap and hold to display Language & Input and turn on Ant Keyboard. 7-8. Type word and tap on search icon. 9. Tap on Share Icon. 12. on Upper right, tap the three dot. 13. Then tap on About. 14. Select Terms of Service. 15-16. Highlight text by holding tap on any text, then the Search Icon show again, tap on it. 17-18. Search the word Setting to display the System Settings as you see in the screenshot, tap on it to go to Settings. 19. Now you are in Settings, Scroll down and go to Apps. 20. Got to tab ALL, scroll down and open Launcher. 21. On App info, Tap GO TO APP button. 22 - 23. Now You can transfer your Quick Shortcut Maker to your phone via USB Cable or SD Card. Install and open Quick Shortcut Maker. 24-25. Search Google Acount Manager, Then tap on Google Account Manager Type Email and Password. 27. Instead of typing a password, tap on three dot on upper right. 28. then tap Browser sign in. 29-30. Now enter your new email, or you can create new. then next. 31-32. Enter Password then sign in. 34. boom!, Gmail account verification has been bypassed. Here is also a alternative video tutorial. To avoid this to happen again, you need to enable OEM Unlocking, to do this you need to show Developers option. 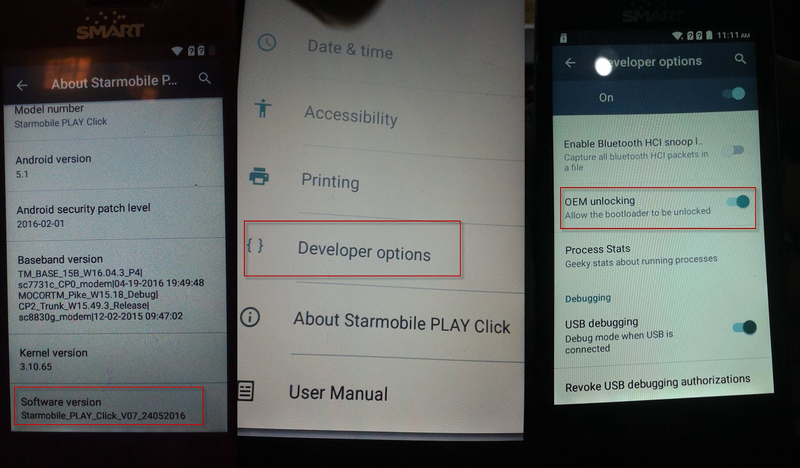 How to Enable USB Debugging, Developers Option and OEM Unlocking in Starmobile Play Click. Tap on Software Version 7 times until it poup that you are now a developer. Go back to Settings the you will see now the Developers option. You can now Enable USB Debugging and OEM Unlocking. i love you. you save my day!! Thank you very much. The "Language" thing did not appear after pressing @? Why? My developer wont popup sir? how to flash new firmare? EZ! THANKS A LOT SIR! Instruction images are a bit tiny to read but nonetheless, this bypass works perfectly! Note: You can use the phone itself to download Quick Shortcut Maker, so yeah, no need for microSD card and USB connector.